You will be descending thousands of feet in elevation on rough trails at the beginning of your trip when your backpack will be heaviest. The steep ascent comes at the end when you’re tired. On many trails you must carry a great deal of water. 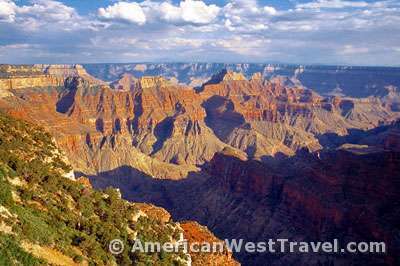 The inner Grand Canyon is a desert with limited water, little shade, and brutal temperatures during the summer, often over 100°F (40°C). In arid conditions, you do not notice your sweat (which evaporates quickly) and will be unaware of dehydration. Heat exhaustion is a real threat. Essential hiking gear includes sturdy boots, water bottles, a hat, sunscreen, and sunglasses. Newcomers to Grand Canyon are advised to hike the corridor trails for their first experience. The Bright Angel Trail from the South Rim, and the North Kaibab Trail from the North Rim end at the Phantom Ranch where there is food, water, and facilities. The trails are heavily traveled and patrolled by rangers; there are water stops and a campground along the way. 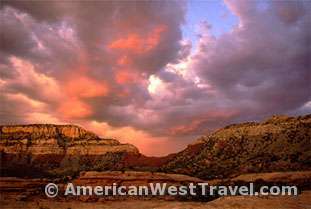 See below for our experiences on some of the Grand Canyon hiking trails. (Photo left) The best spot we ever camped at. A lush and very private beach at the mouth of Boucher Canyon. Being close to the river provides some relief from the heat. (Photo right) A sweet view from the Thunder River trail. The shot was taken on the Esplanade, a large terrace north of the river. North Kaibab Trail (twice) – From the North Rim to the Phantom Ranch at the Colorado River. This trail is 14 miles one way, very strenuous to do in one day. The trail drops quickly from the rim into Roaring Springs Canyon which flows into Bright Angel Canyon. Much of the walking is in a desert environment – very hot in the spring and summer. Water readily available, plenty of other hikers around. The Cottonwood Campground is about halfway if you can get a reservation. Bright Angel Trail – Nine miles from the South Rim to Phantom Ranch. Most heavily used trail. Oriented to “tourist” hikers. Water readily available, nice rest area at Indian Gardens Campground (slim chance for reservations), and lots of rangers around. Fairly easy hike though final descent to the river is very steep. Best bet for the inexperienced hiker. South Kaibab Trail – Seven miles from rim to Phantom Ranch. Shorter distance than Bright Angel, but waterless, mostly shadeless, and steeper. Hermit Trail – Leaves the south rim west of Grand Canyon Village and reaches the river via Hermit Creek. The trail is easier than Bright Angel but is waterless until reaching Hermit Creek a couple miles from the river. The creek is very lush and pleasant. Fewer hikers than Bright Angel, a nice experience. 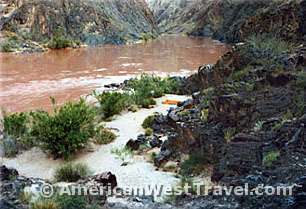 Tonto Trail – Runs along the Tonto Platform about midway between the rim and river. Connects many of the rim to river trails. Platform is a waterless desert but the trail dips into many side canyons which often have water and shade. More solitude on this trail but the ups and downs can become very tedious. Boucher Trail – A challenging secondary trail which branches off of the Hermit Trail and reaches the river at Boucher Creek. The trail is occasionally hard to follow and is very steep in places. Very strenuous since there’s not much of a trail. Not for the beginner. You can make a nice loop by going down Boucher, then connecting back to the Hermit Trail via the Tonto Trail. 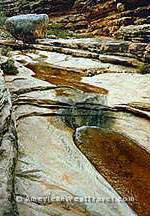 Bass Trail – Access from the south rim to the river about 40 miles west of Grand Canyon Village. Degree of difficulty is comparable to Hermit trail. However vehicular access to the trailhead is very difficult and probably impossible when the roads are wet. Very remote area, more solitude. Bill Hall / Thunder River Trail. 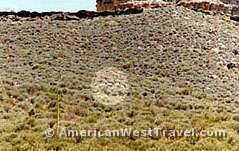 – Accesses a fascinating area from the North Rim west of the main corridor. The trail reaches Thunder River and its beautiful hanging gardens, roaring Tapeats Creek, and spectacular Deer Creek Falls. The initial descent to the Esplanade (the platform north of the river) is fairly easy, the descent through the Redwall (into the inner canyon) is pretty strenuous. All the trails are secondary and not maintained. No water between the rim and Thunder River. Kanab Creek. – Very remote. Access by difficult secondary trails. Progress through the canyon is strenuous. For experienced, self-sufficient backpackers. For more info, see our feature story, “Grand Canyon Hiking Adventure – The Kanab Creek Loop, Death March or Grand Adventure?”. (Photo left) Tapeats Creek comes roaring downstream. It it fed by a huge spring high on the inner canyon wall. Thunder River enters the creek here, flowing from another large spring. During the spring runoff, the water flow can be spectacular. 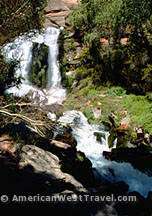 (Photo center) Deer Creek Falls is one of the canyon’s most beautiful scenes. The falls drops over 100 feet from the Deer Creek Narrows, a solid rock slot canyon which has the appearance and feel of a tunnel. (Photo right) A tiny stream flows through a side canyon. This is much more typical of the inner canyon which is actually a desert. Lush streams and springs are rather infrequent, and most side canyons will dry up in late summer. A rare sighting of Grand Canyon bighorn sheep. These creatures are very elusive, and it is indeed a rare opportunity to spot them from a main trail, in this case, the Tonto Trail. A bald eagle soars high above the Colorado river in Glen Canyon. This canyon is actually a short distance upstream from the national park. 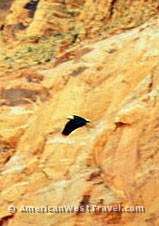 This section of canyon below Glen Canyon dam is a world-class trout fishery, and birds such as this eagle are therefore very well fed. This eagle was in fact eating a trout on its perch just before this picture was taken. To learn more about fishing the Colorado River, check out our Lee’s Ferry page. A closeup of some beautiful cactus flowers. Late April and early May after a rainy winter will bring many such displays. Flowering cacti are pretty dependable most years in the desert environment of the inner canyon while wildflowers will stay dormant if the winter has been dry.